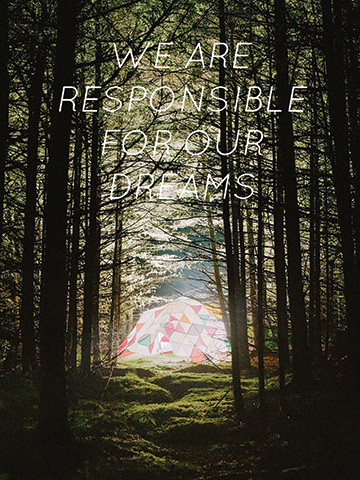 WE ARE RESPONSIBLE FOR OUR DREAMS is a nomadic platform for collective dreaming and utopic visions in which participatory dream sessions take place inside a 21’x21’ blanket fort. My first task on Cabin-Time was to survey Sheep Island for a suitable site for the blanket fort. I found myself drawn to two paths at opposite ends of the island; both led to the same idyllic spot. We installed the blanket fort in a secluded clearing (just within audible range of the dinner bell) suspended from tall fir trees over the softest bed of moss imaginable. One evening after dinner, we all walked in a lamp-lit procession along the path to the blanket fort for a slumber party. We each settled into a cozy spot on the mossy bed beneath the tessellated fabric canopy, burned palo santo, and imbibed as our broken cassette player sporadically emanated lush tones from Music For Airports. We talked about deep time and vast space, our earliest memories and our near death experiences, tangents and ghosts late into the night until one by one we drifted into dreamland. The blanket fort remained installed for the duration of our stay on Sheep Island as an open social space. Shawn Landis used it as his primary site for recording conversations with each of us for his podcast. WE ARE RESPONSIBLE FOR OUR DREAMS packs into a suitcase and will continue to circulate around the world on perpetual slumber party tour. 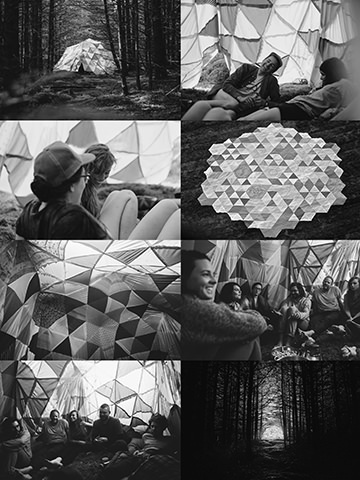 Kevin Clancy is an interdisciplinary artist who creates accumulative process-based installations, participatory experiences, and nomadic social spaces that provide momentary glimpses into utopic possibilities. He has exhibited work at Keleketla! Library, VIVO Media Arts Centre, Flux Factory, Mattress Factory, Mobius, ILLUMINUS, and Samsøn.